محمدی, سید داود, محرم‌زاده سرای, خلیل. (1393). بررسی رفتار زمین‌شناسی مهندسی خاک‌های سطحی آلوده به هیدروکربن‌های نفتی در محدوده پالایشگاه تبریز. نشریه انجمن زمین شناسی مهندسی ایران, 7(شماره 1 و 2), 41-56. سید داود محمدی; خلیل محرم‌زاده سرای. "بررسی رفتار زمین‌شناسی مهندسی خاک‌های سطحی آلوده به هیدروکربن‌های نفتی در محدوده پالایشگاه تبریز". نشریه انجمن زمین شناسی مهندسی ایران, 7, شماره 1 و 2, 1393, 41-56. محمدی, سید داود, محرم‌زاده سرای, خلیل. (1393). 'بررسی رفتار زمین‌شناسی مهندسی خاک‌های سطحی آلوده به هیدروکربن‌های نفتی در محدوده پالایشگاه تبریز', نشریه انجمن زمین شناسی مهندسی ایران, 7(شماره 1 و 2), pp. 41-56. محمدی, سید داود, محرم‌زاده سرای, خلیل. بررسی رفتار زمین‌شناسی مهندسی خاک‌های سطحی آلوده به هیدروکربن‌های نفتی در محدوده پالایشگاه تبریز. نشریه انجمن زمین شناسی مهندسی ایران, 1393; 7(شماره 1 و 2): 41-56. نفوذ مواد نفتی در خاک علاوه بر اثرات زیست‌محیطی می­تواند باعث تغییر خصوصیات زمین­شناسی مهندسی خاک‌ها شود. در این پژوهش رفتار زمین­شناسی مهندسی خاک­های سطحی آلوده محدوده پالایشگاه نفت تبریز بررسی شده است. مواد نفتی آلوده‌کننده نمونه­های خاک مورد مطالعه از نوع هیدروکربن­های آلکانی جامد با بیش از 14 زنجیره­ اتم کربن (C14) می‌باشند. بر اساس نتایج حاصل از آزمایش های دانه­بندی، نمونه­ها در رده خاک‌های SM و CL قرار می‌گیرند. نتایج آزمایش حدود آتربرگ در نمونه‌های CL نشان می­دهد که شاخص خمیری (PI) در نمونه خاک دارای آلودگی بیشتر، کمترین مقدار بوده و با کاهش غلظت آلودگی، افزایش می یابد و تمامی نمونه‌های آلوده SM رفتار غیرخمیری داشته‌اند. در آزمایش‌های تراکم استاندارد، نمونه­های با آلودگی بیشتر با درصد رطوبت بهینه کمتری به وزن واحد حجم خشک حداکثر رسیده­اند. همچنین نتایج آزمایش‌های نسبت باربری کالیفرنیا بیانگر کاهش مقدار CBR با افزایش میزان آلودگی بوده که این کاهش در نمونه­های CL به مراتب بیشتر از نمونه­های SM می­باشد. بر اساس داده­های حاصل از آزمایش­های برش مستقیم و تحکیم، با افزایش میزان آلودگی خاک، به ترتیب پارامترهای مقاومت برشی (چسبندگی و زاویه اصطکاک داخلی) کاهش و نشست تحکیمی افزایش یافته است. Infiltration of oil materials into the soils has environmental impacts and changes engineering geological properties of soils. 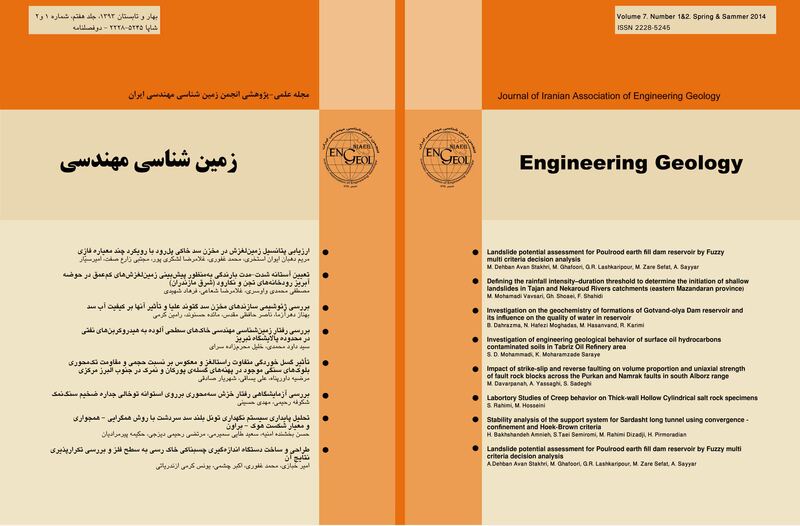 This paper has investigated the engineering geological behaviour of contaminated soils from the Tabriz Oil Refinery. The oil materials contaminations were alkenes hydrocarbon that had more than 14 carbon atoms (C14) and is classified in the solid – phase. Based on the results of particle size analysis, there were two types of contaminated soils including silty sand (SM) and lean clay (CL). The results of Atterberg test on CL sample show that the plasticity index (PI) decreased for more contamination and all of SM samples were none plastic. In standard compaction tests, the samples with more contamination was reached to maximum dry unite weight in lower optimum water content. Also, the CBR test results show that with increase of contamination, the CBR was decreased and the reduction for CL sample was more than the SM sample. Based on obtained data from direct shear and consolidation tests, the shear strength parameters (cohesion and internal friction angle) were decreased and the consolidation settlement was increased, respectively. افلاکی، ا.،1380 ، آزمایشگاه مکانیک خاک، نشردانشگاه صنعتی امیر­کبیر. صدیقیان.م.ح.،1383، بررسی آزمایشگاهی تأثیر آلودگی به نفت خام بر پارامترهای مقاومت، نشست و تراکم پذیری ماسه، اولین کنگره ملی مهندسی عمران، 1752-83. طاحونی، ش.، 1381، اصول مهندسی ژئوتکنیک، جلد اول، مکانیک خاک (ترجمه)، انتشارات امیر­کبیر. Acar, Y.B., Hamidon, A., and Field, S.D., 1985. The Effect of organic fluids on hydraulic conductity of compacted kaolinite. American Society for Testing and Materials, 874: 171 – 187. Alsanad, I., Esmaeal., K., 1995. Aging effect on oil Contaminated Kuwaiti sand. Journal of Geotechnical and GeoEnvironmental Engineering, ASCE, 123(3): 290-294. Alsanad.H.A., Eid.W. K. l., 1997. Geotechnical properties of oil contaminated Kuwaiti sand. Journal of Geotechnical Engineering, ASCE, 121(5): 407-412. Aiban, A., 1998. The effect of temperature on the engineering properties of oil contaminated sand. Journal of Environmen International, 24(1- 2): 153-161. ASTM D422., 2000. Standard test methods for particle size analysis of soils. Annual Books of ASTM Standards. ASTM D4318., 2000. Standard test method for liquid limit, plastic limit and plasticity index of soil. Annual Books of ASTM Standards. ASTM D698., 2000. Standard test methods for laboratory compaction characteristic. Annual Books of ASTM Standard. ASTM D1883., 2000. Standard test method for CBR (California Bearing Ratio) of laboratory-compacted soils. Annual Books of ASTM Standards. ASTM D2435., 2000. Standard test method for one dimentional consolidation properties of soils. Annual Books of ASTM Standard. ASTM D3080., 2000. Standard test method for direct shear test of soils. Annual Books of ASTM Standards. Khamehchiyan, M., Charkhabi, A. H., Tajik, M., 2007. Effects of crude oil contamination on geotechnical properties of clayey and sandy soils method. Engineering Geology, 89: 220 –229. Lekkmine, D.E., 1991. Effect of petroleum hydrocarbons on the shear strength and compressibility of soil. Ph.D Thesis, Steven Institute of Technology, Castle Point, Hobsken, New Jersey. Meegoda, N. I., Ratnaweera, K., 1994. Compressibility of contaminated fine soil. Journal Geotechnical Testing, 17(1): 101-112. Praisler, M., Gosav, S., Van Bocxlaer, J., De Leenheer, A., and Massart, D. L., 2002. Exploratory analysis for the identification of Amphetamines using neural networks and GC-FTIR data. The Annals of the University Dunarea de Jos, Fascicle II, p. 83-96, ISSN 1221-4531. Shin, E.C., Lee, I. B., Das, B. M., 1999. Bearing capacity of a model seal footing on crude oil contaminated sand. Journal of Geotechnical and Geological Engineering, Kluwer Academic Publishers, 17: 123-132. Sivapullaiah, P.V., Sitharam, T.G. Subbareo, K.S., 1987. Clay-organic molecule interaction: consolidation behaviour. Department of Civil Engineering, Indian Institute of Science, Bangalore 560 012, Clay Research, 6(2): 76-80. Vijay, K., Puri, A. D., 2000. Geotechnical aspects of oil contaminated sands, soil and sediment contamination, 9(4):359-374.